I've been developing some techniques and glazes to create these little gems. 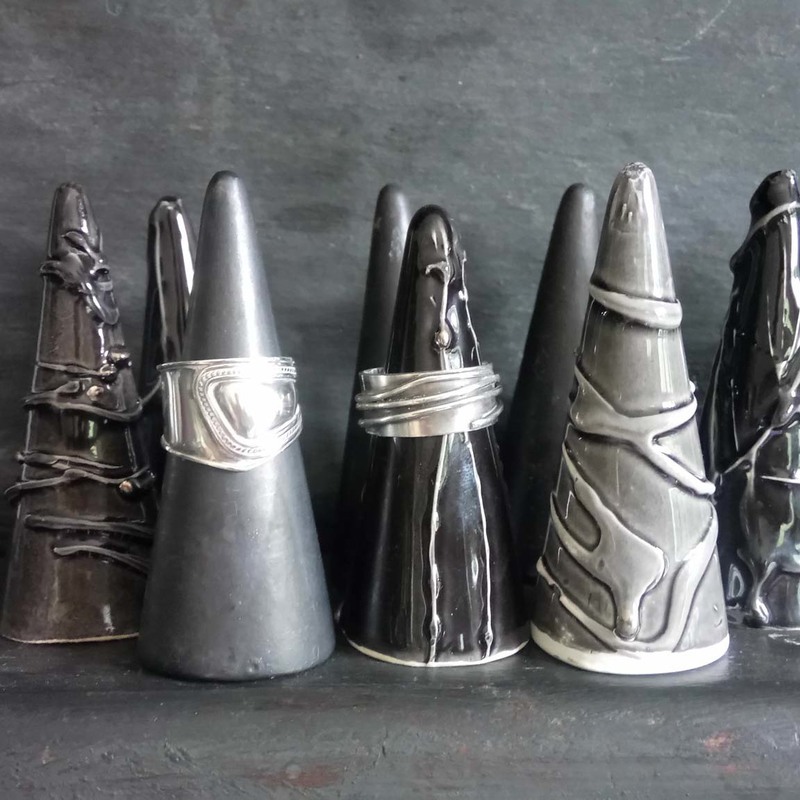 They are created using a small batch production technique called slip casting. The original shape was created by me by throwing a piece of clay on my potter's wheel. I then made a plaster mould from which to create similar forms. Once the mould was made, I use casting slip to cast the form. The viscosity of the slip is controlled in different ways to create the random mark making, which incidentally is inspired by raindrops on windows. Glazes range from satin pewter, to high gloss with a hint of the metalic. Mostly shades of grey to black, some are also midnight blue. The final touch is to add either some Platinum Lustre, or 22 carat Gold Lustre which is then fired to over 600 degrees centigrade to permanently fuse with the piece. They are ideal to lovingly care for your rings at the same time as having them visually present in your life, even when you are not actually wearing them. For those of us who like little groups of things that we can arrange, re-arrange and generally fiddle with, these are perfect! At just £10 each they are a great gift on their own, or in sets of three for that little group I mentioned earlier. They measure between 8 and 10cm in height, and each have their own personality. Until my e-commerce facility is functioning, email me for details of payment if you want to purchase.